See, we've been so focused on which political party would take control of Westminster that we almost missed a surprise faction moving in this weekend. 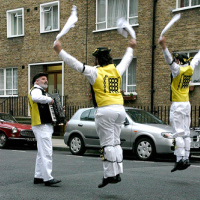 Tomorrow, almost 200 Morris Men will inundate Westminster with their twirling hankies, bells and braces. The annual Day of Dance, observed since 1954, will see various styles of prancery, such as Cotswold Morris (sticks & hankies), Border (more vigorous dancing with lots of hooting and face paint), and Longsword (originating from various parts of The North). After numerous localised demonstrations of Morris-craft, the highlight comes at 5pm with a mass ensemble in Traf Square. To get you in the mood, read our probing interview ("It's all a bit silly, isn't it?") with Westminster Morris Man Jason B. Standing (who also supplied the image above).